Business owners are generally unaware of the health hazards associated with feral pigeons (Columbia livia) in commercial areas, so removing and deterring these pest birds from roosting on your premises is important for the health and safety of your customers and employees. Once a group of pigeons have found a good nesting location on your business premises, you face the risk of them attracting other pigeons too, which could potentially turn a small problem into a much more serious one. Did you know that feral pigeons now cost business owners millions of dollars each year in property damage, repairs and sanitation expenses? If you’re concerned about the potential health hazards that can be caused by pigeons, contact us on (877) 885-4087 for further advice on our pigeon deterrent solutions or to schedule a FREE inspection of your premises. Pigeons have the potential of transmitting over 30 diseases, illnesses and infections to humans and several more to domestic animals, as a result of bird droppings, feathers and debris under a roost – particularly if roosts have been active for years. Pigeons have been identified as carriers of bacterial (e.g. listeriosis & salmonella), chlamydial, mycotic, parasitic, protozoal (e.g. toxoplasmosis & trichomoniasis) and rickettsial diseases, as well as dermatosis. 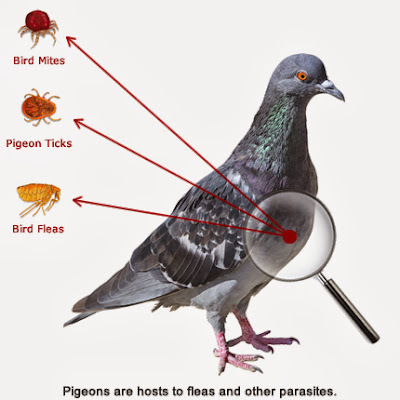 Feral pigeons also plays hosts to parasites like pigeon ticks (Argus relexus), pigeon fleas (Ceratophyluss columbae) and bird mites (Dermynyssus gallinae). Pigeon droppings (or guano) are not only an eyesore, unsanitary, and very costly to clean up, but are also known to help spread disease and can cause some serious health problems in humans. Soil and pigeon droppings are among the sources of infection which can result in meningitis. A large percentage of the pigeon population on the west coast of the United States are carriers. Quite similar to histoplasmosis. Contracted through inhalation of fungal spores in pigeon or starling droppings. The most affected are the young, elderly and people with immune system deficiencies. Bacterial infection that can be transmitted via droppings, feathers and eggs and which is typically either inhaled or ingested. The list above is by no means a comprehensive list of the diseases that can be transmitted by feral pigeons. While pigeon proofing and pigeon deterrent measures cannot completely prevent or stop pigeons playing a role in disease transmission, what they do offer is a minimal amount of contact between these disease carrying pests and humans. At Ehrlich, we know that pest pigeons can cause some serious health problems for business owners, which is why we have been committed to offering pigeon control services in North America since 1928. Call us now on (877) 885-4087. Ehrlich’s safe, eco-friendly bird deterrent and bird proofing products can provide extremely effective & economical solutions to ensure that you minimize the health risks presented by pigeon infestations at your business premises.